"For a quick meal that's elegant enough to serve to company, you can't beat the combination of shrimp, pesto, and pasta. Using garlic scapes instead of basil and garlic gives this dish a lighter note." Place garlic scapes, Romano cheese, parsley, and walnuts in the bowl of a food processor; pulse to combine. Scrape down sides. Turn on food processor; pour in olive oil and lemon juice while processing pesto until smooth. Fill a large pot with lightly salted water and bring to a rolling boil. Stir in pasta, bring back to a boil, and cook over medium heat until tender yet firm to the bite, about 11 minutes. Drain and transfer to a large bowl. 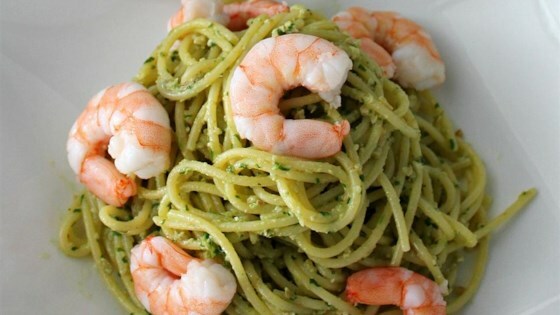 Stir pesto and shrimp into the pasta. Season with salt and black pepper. Squeeze a lemon wedge over pasta and serve remaining wedges alongside. Parmesan cheese may be substituted for the Romano cheese. I didn't have garlic scapes so I just used minced garlic. Probably had a little more garlic flavor but it was amazing! A lovely, delicate pesto. I used gf spaghetti. Thank you BigShotsMom. It was pretty good. I’d probably make it again.